Treat your team and your clients to the tastiest restaurant food, on demand. 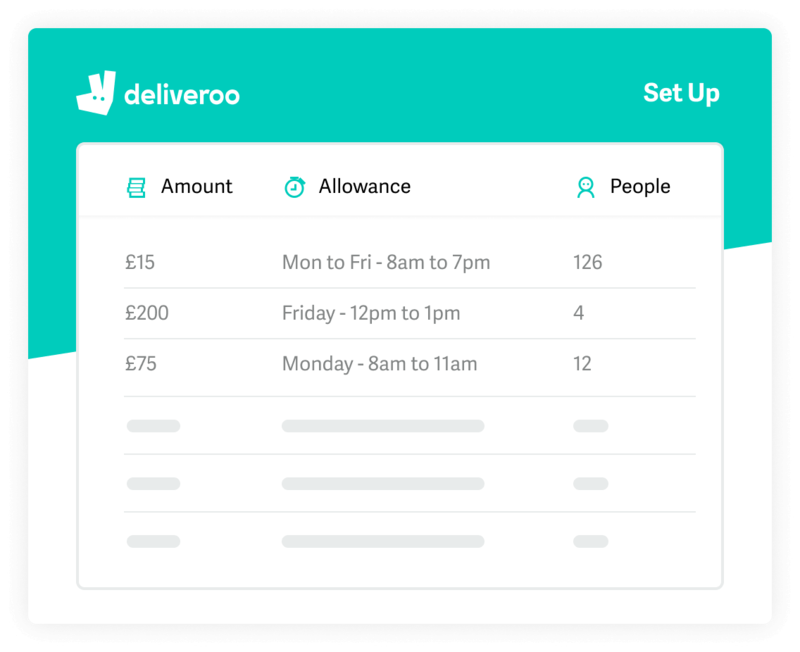 Introducing Deliveroo for Business. Goodbye lacklustre office catering, hello Taco Tuesdays! Make your office happier. Fill it with food. You’ll get your own, dedicated account manager and a frictionless tool for controlling everything. Deliveroo for Business is loved by teams around the world. 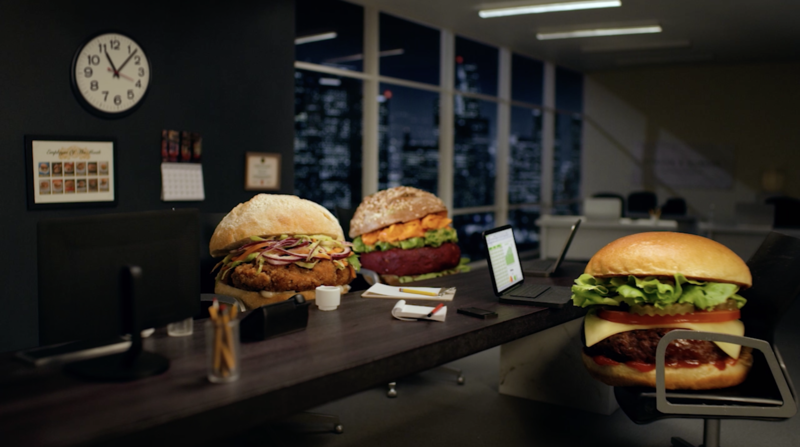 "When we’re at the office late, we can order food on the company account. Staff often work late into the evenings, so being able to get great food from a wide range of restaurants helps keep the team motivated." "Having healthy food on hand really affects our focus levels. 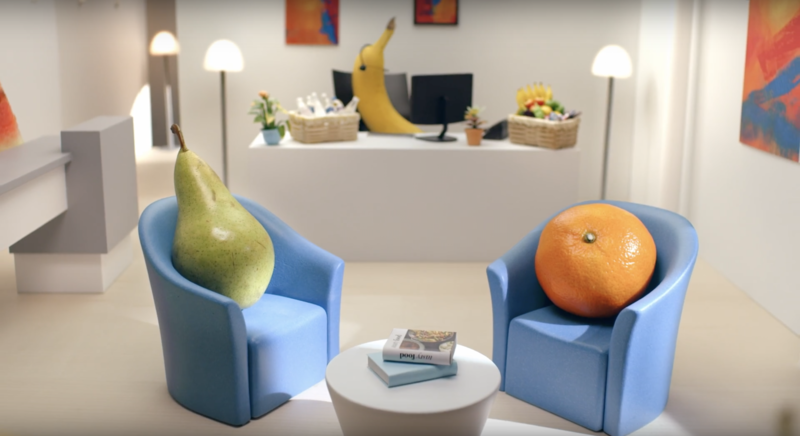 With a crate of the freshest, tastiest fruit in the office, we spend more time getting things done, less time going out for snacks and drinks. We no longer have a post-lunch energy dip, either. We would recommend a Deliveroo for Business fruit box for any office, big or small!" "Deliveroo for Business are a joy to work with. Our corporate account is very simple to manage, and the account managers have helped fuel our company parties with amazing food and snacks. Ordering food has never been so easy!" 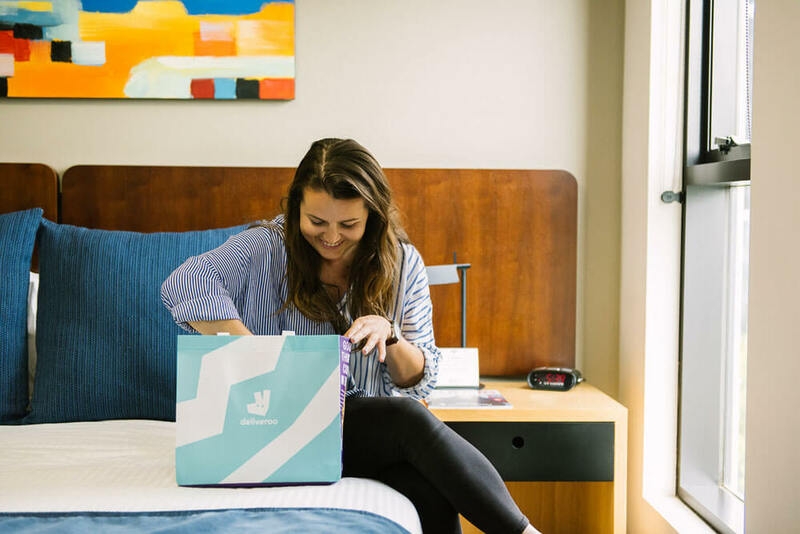 "What we love about Deliveroo for Business is the choice of options and the flexibility to order at different times of the day, for all type of meetings; using Deliveroo for Business means we can order what we like for when we need it. We love it!" 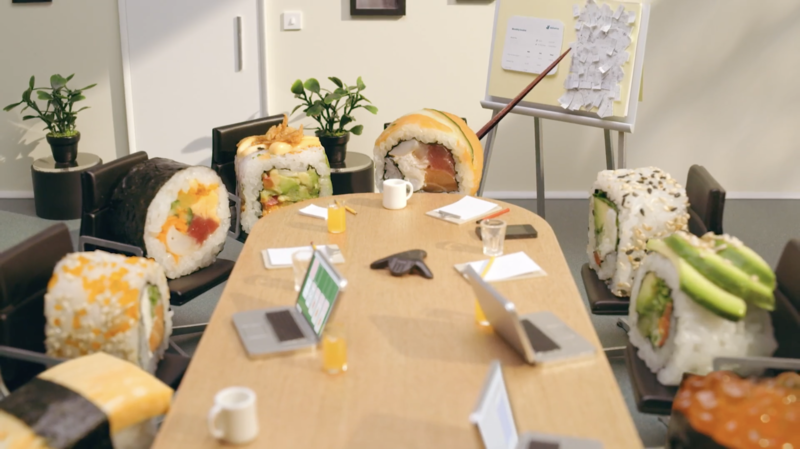 "Despite how quickly our business has grown, teams at our firm still eat lunch together. We believe it is crucial in order to ensure that people never feel divided, regardless of their position. The fantastic range of restaurants on Deliveroo has enabled us to do exactly that. We love the fact that we have a dedicated account manager who is always on hand to recommend restaurants to ensure that our teams are able to dig into the tastiest food!" Create an allowance for teams or individuals and rules for how they use it. You could make it available only when they order to the office, or when they're working out-of-hours. ...they order, track and eat! 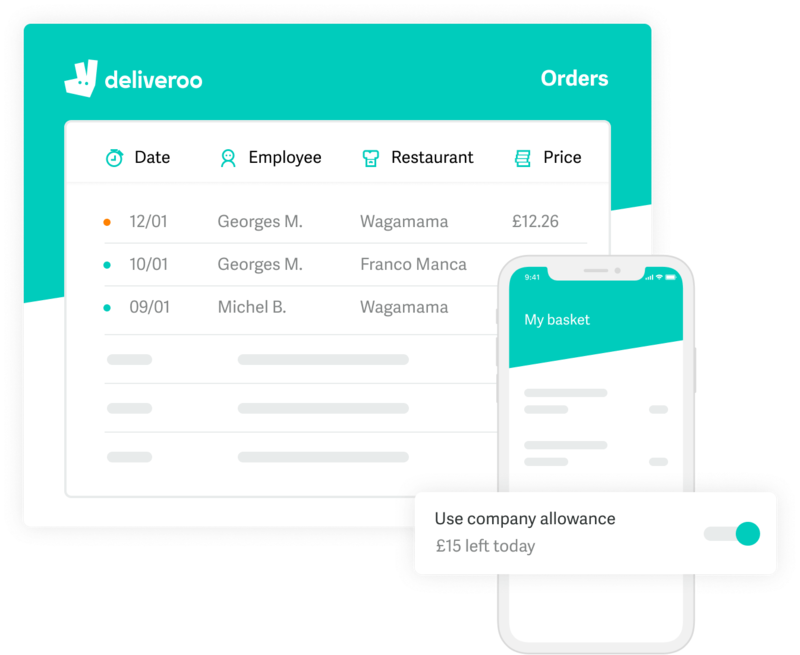 Your team uses their Deliveroo app to order food for delivery. One tap at checkout charges it straight to the company. They’ll know exactly when their food’s arriving with real-time tracking from restaurant to office. Forget about fiddly expense systems and hoarding receipts. 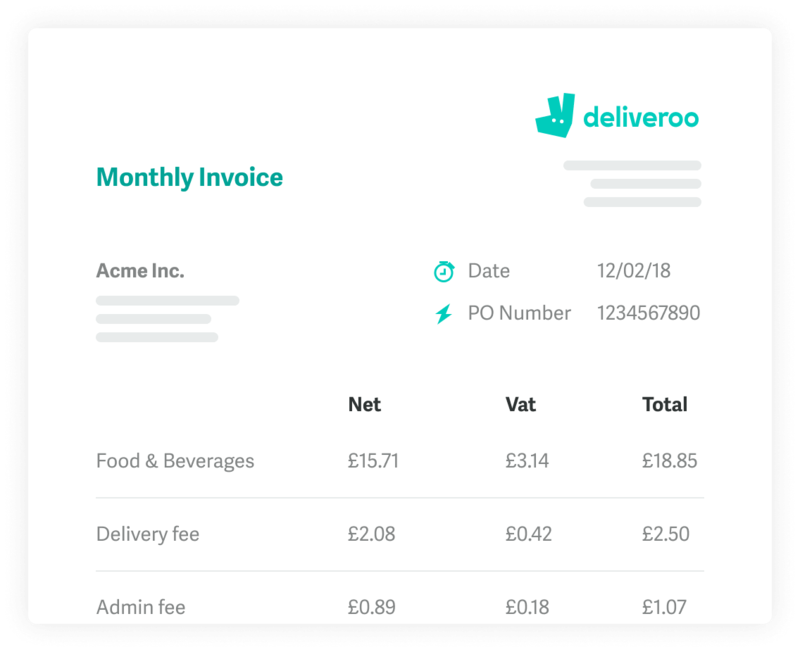 Deliveroo for Business gives you one transparent bill, with VAT information outlined. "Clients reach out to me to help them find the right food for the right occasion. 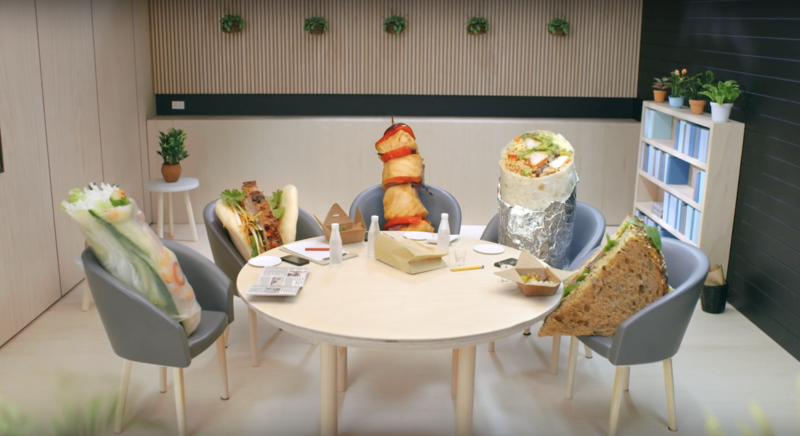 There are a lot of options on Deliveroo and we happen to know what's trending!" "My clients love the fact that regardless of whether they're planning a meal for 20 or corporate catering for 200 people, I am always on hand to help them out from start to finish." Problem solver, foodie expert and technical whiz, all rolled into one. Your dedicated accounted manager will answer your questions, solve your food & beverage related challenges and help you manage everything. Give every guest their ideal menu, from pastries and coffee at breakfast to late-night sushi and drinks. Create your own branded menu (we can help!) or have guests order on the app from a tablet. All without the cost of running a kitchen. 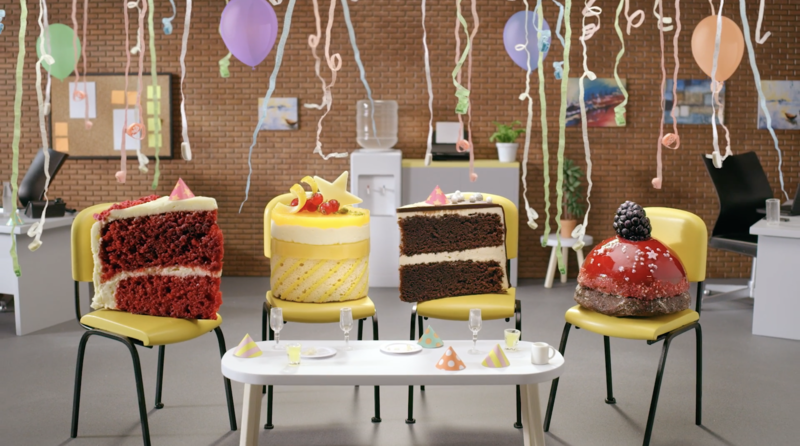 Talk to us today about how Deliveroo for Business can help you delight your guests. See how Deliveroo for Business can transform your office culture and boost your bottom line. Get in touch – we’ll have your account up and running in no time.